The Mobile-Tensaw Delta is our nation’s second largest river delta. It encompasses a vast wetland characterized by estuarine marsh, cypress-tupelo swamp and bottomland hardwood ecosystems. The Delta has over 50 rare and endangered plant and animal species known to inhabit its wetlands and waterways. The region encompasses 250,000 acres, of which 100,000 are publicly owned and managed. In January 2003 Alabama State Lands implemented the Upper Bartram Canoe Trail system which provides opportunities for recreational boaters, specifically canoeist and kayakers, to enjoy the rivers, streams, lakes, sloughs and bayous of the Delta. Currently, the State Lands Division maintains six day-use trails and six overnight trails. There are two land-based campsites and four floating platform campsites available for the overnight routes. The land based camping areas are open to anyone on a first-come first-served basis. The floating platform campsites are limited to groups no larger than eight and are available by reservation only. Reservations are limited to canoeists and kayakers. 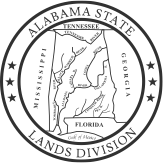 In January 2018 Alabama State Lands implemented the Lower Bartram Canoe Trail system. Currently, the State Lands Division maintains four elevated camping shelters on the east side of the lower delta that are available for overnight use. These shelters are accessible from several local landings including Historic Blakely State Park and 5 Rivers Delta Center. These campsites are limited to groups no larger than eight and are available by reservation only. Reservations are limited to canoeists and kayakers.